I get asked a lot from small and medium business owners if I think Yellow Pages are worth the cost. If I have to give a blanket answer then, “no, Yellow Pages are not worth it” but print directories are still effective for some businesses for certain markets. In short, the people more likely to use print directories are old people and people with low-incomes. In other words, people who do not use or do not have abundant access to the internet are more likely to use print directories. Also, people with no electricity say they come in very handy. If you could place ads for ice, water, and generators in print books during hurricane seasons along the Gulf and Eastern US coastlines, you might have luck. There is another factor I used to come across (say, 2006 to 2009) when asking people if and how they use print directories but I don’t really hear it much anymore. People were more likely to use Yellow Pages to find businesses they perceived to be slow technology adapters. For instance, someone might have used a print directory to find a plumber or appliance repair company but would go straight to the internet to find someone to repair their computer. With the proliferation of the internet, though, I haven’t heard people say they use anything other than the internet for a while (except for old people and/or people without internet access). For What Businesses do Yellow Pages Work? There are a lot of answers to this question — and maybe we’ll try to make a list. The obvious answer within the context of this post is that those businesses that target the demographics mentioned above can expect more leads from their ads. Here’s the thing: Businesses that do not target those markets can also expect to get leads from them (and that’s about all). Do you want those leads? You might. You might not. You might prefer that your competitors get them. Print directories can also still produce strong leads for companies whose market truly reaches across all demographics? Feel like a pizza tonight? The pizza companies you probably think of first don’t care about your age or income. You will have to assess whether your business fits this but be honest with yourself about who you want to reach. It’s not 1997 anymore. It’s not even 2007 anymore. Seriously, people use the internet now — and they’re even searching for yellowpages.com and yellowbook.com less and less. 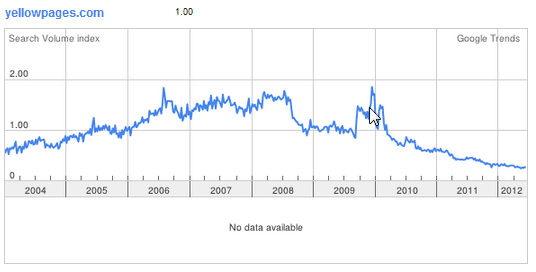 Make what you want of these Google Trends snapshots I took on 6/24/12 as I was writing this. 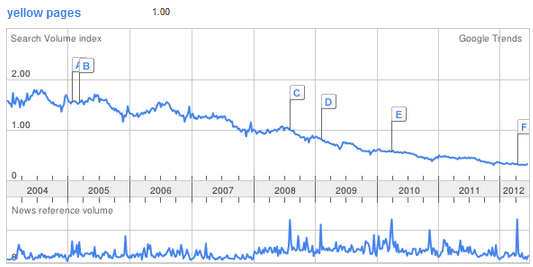 The trend is clearly downward for people searching for these terms, though. From my experience, specifically with plumbers and attorneys, unless you can afford the full page ad in the print directory — which often gets put before all the other ads — then your marketing budget will be almost completely wasted in the print directory. The big ads get the leads and the small ones hardly get noticed. That’s life. It’s just that this particular slice of life affects your business. They have excellent sales forces that use strong marketing materials, hard sales tactics, and metrics that don’t tell the whole story. Most advertisers don’t track their ads and only rely on the incomplete information from the sales people to decide whether to sign up. Your competitors are in them so you feel like you need to be. No kidding, I really believe those are the 3 reasons they are still in business. I don’t think the volume of businesses for whom they are truly and profitably effective is enough to print more than a glorified booklet — and what’s the value of keeping that around? You need to know how many calls your ads produce. If after thinking long and hard about your print directory ads, you still want to keep them then please — please — track them for the next year. The salespeople can give you a tracking number for your ad for a fee or — and, this is my preferred method — they will provide it because you mention that you will only continue the contract if they will throw it in. …and then they cancel or sharply reduce the ad (in almost every case ever). In every case I’ve see where a client dropped their yellow pages ads and used the money for other marketing — usually for online marketing and/or direct mail — they got more leads so quickly they never even thought about looking back. We actually have clients because they dropped their print directory ads and gave us the budget to handle. I hate for that to sound like a plug for us but, seriously, we have clients from that — and they’ve been successful clients. When I glance back through this, I know it sounds like I must really hate print directories. Well, I don’t but I don’t have any clients who they’ve been truly effective for in the past 5 years. In fact, I can think of three salespeople for print directories who I really enjoy meeting with. Hi, Jim. I hope you don’t read this but feel free to call me if you do. Always glad to catch up. See, we put our clients’ marketing budgets where they will be most effective. We have to. It’s our duty to our clients and I don’t think Yellow Book or Yellow Pages are worth the cost. If I thought putting marketing dollars into Yellow Pages, Yellow Book, or any other local print directory would deliver quality leads more cost-effectively than the other available marketing options the money would go to the print directories. But, that never happens anymore. in 2002, companies were still easily making big money with ads in the Yellow Pages. Now, print directories are for marginal marketing. If you are fortunate enough to have so much money for marketing that you have actually used, maximized, and exhausted all other media then you should heavily consider putting a nice full-page ad in your local print directories. By the way, I’d love to hear your recent experience with print directory marketing. I’d even be glad to hear from sales people or producers of print directories. Post a comment or even call. I have hard numbers, we service residential and commercial heating and air conditioning systems. We recognized in 2012 that our YP ad was not performing very well but we determined that we did reap some ROI but not much above breaking even. So, in 2013, we have spent more on the ad than we have earned in GROSS sales that the ad has produced. Of course we acquired some new customers that will produce more income in the future, however, the total of new customers that our ad has produced is 40, (in 8 months time and the peak season is now over) When you consider that we spent over 40k for our full page/full color ad, that places the cost of acquiring those customers at $1000.00 each while the average invoice totals for each customer is $415. If I were to consider only the NET income from those sales, the RIO is far more dismal. We keep hearing that for plumbers and hvac service companies etc that the YP ads still have great value, I say that is just plain a lie.